We headed back to the Zimbabwe-Botswana border from Vic Falls early the next morning. We were met by a guide from Kalahari Tours and transported to their base in Kasane. Another win, the company showed up as promised. 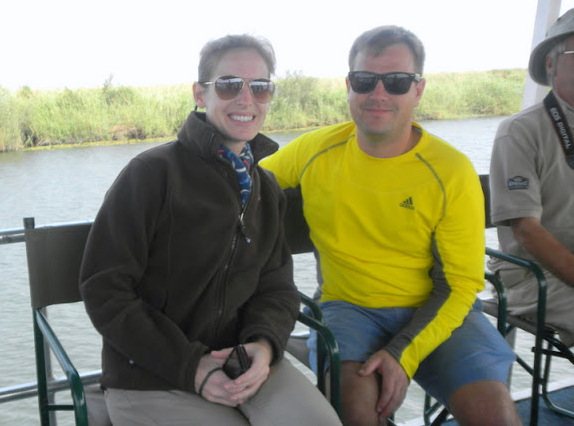 After a nice breakfast that included real coffee and Botswana donuts (a fat cake in the shape of a donut with a little powdered sugar on top), we joined about 20 other folks for a Chobe River Cruise. It was a beautiful cool breezy day. The boat was a double decker pontoon with two guides. 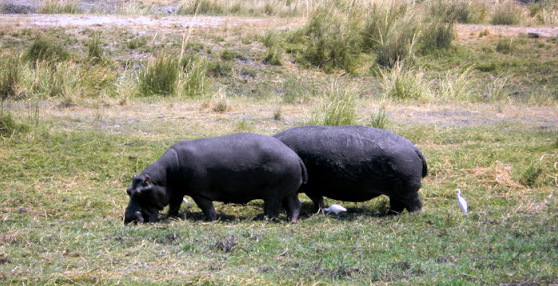 Betsy was always fascinated with hippos as a child, and I hoped we would see a few. Not only did we see a few, we saw many, many, many. Large clumps of them in the water and a couple grazing on Sedudu Island. We saw crocodiles galore and water monitor lizards that look like prehistoric animals, as well as a few elephants, all different kinds of antelope, buffalo and beautiful birds. Best of all for me, was watching Betsy and Mike spot wild animals and marvel with glee at what they were seeing. After returning back to the Kalahari base for a huge lunch, we loaded in to safari trucks for a game drive in Chobe National Park, where we would camp for one night. Our truck had the four of us, plus two women: an American doctor and nurse who were working in a mission hospital in Zambia, and two other women who worked at a lion rescue operation in another African country. A second truck had another group with whom we would share the camping trip. 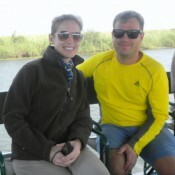 Our guide was a large dark skinned man, full of knowledge about Chobe and its animals, and also full of patience. 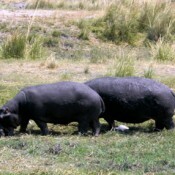 After we entered the park, driving over uneven sandy roads, the first animals we saw were warthogs. They were walking through town in Vic Falls, so this was not a new experience. But they are always fun to watch, with their short legs, wide necks and hairy little faces with curved horns, as they kneel on their front legs to dig around for food. On we went, bouncing along. 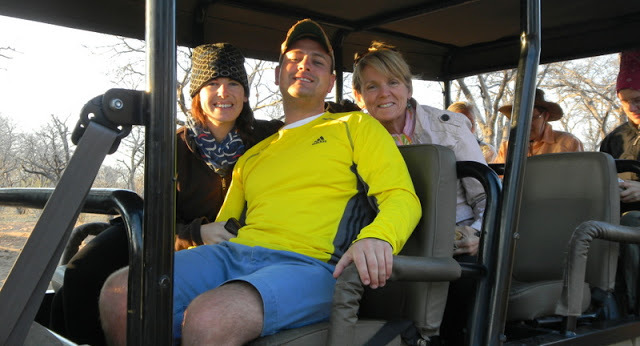 Betsy and Mike were scouring the landscape, spotting giraffe and elephants, impala, and kudu. We finally stopped to watch a family of elephants eating the greens of trees and shrubs, one or two just twenty yards away on the side of the truck facing Marion and Mike. As one midsized elephant finished his tree, he started walking towards us to cross the road. Instead of walking in front of the truck, he headed straight toward Marion and Mike, stopping just a few feet away. As we all leaned away from him, he lifted his trunk and I thought he was going to curl it around Mike’s neck and pull him out. Then he turned away and walked off. Very cool. Next encounter, lions. 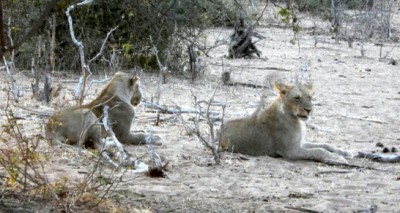 We came across five female lions waking up from a midday nap in the late afternoon. It was time for them to get ready for an evening of hunting. Their behavior is just like that of domestic cats, stretching, yawning, and head butting each other, as if to say, “Hey, get up sleepy head, it’s time to start moving, we gotta find dinner.” One by one they came out from under the shrubs where they had been napping. The biggest female walked right by the truck first, down the middle of the road and plopped down about twenty feet in front of the truck. Her companions followed, until all were sitting on one side of the sandy road nearby, seemingly oblivious to us in the truck. We all sat quietly, marveling at the closeness of the lions. As one of the ladies in back moved to take a photo, one of the lions looked intensely at her, appearing to recognize potential prey, and changed position from relax mode to thinking about pouncing mode. The guide started the truck and we moved on, squealing with excitement. Next the truck headed to the river bank and we were greeted with a spectacular site. Hundreds of animals were sharing the water spot. Giraffe were awkwardly spreading their legs to bend long necks forward to take a drink. Behind them grazed water buffalo, zebra and elephants. 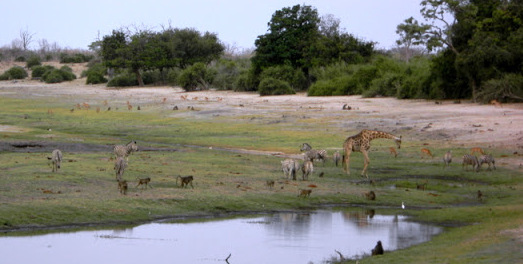 Kudu and impala were there as well. Truly breathtaking to see so many animals in the wild together. We got to the campsite, where each couple had a two-man tent already set up and waiting for us, each with thick mattresses and sheets. There was a shower tent and a latrine tent. Wine was available and we chatted with others in the group about the events of the day around a blazing campfire, as the sun set. There were two women at the campsite who had been there the night before. 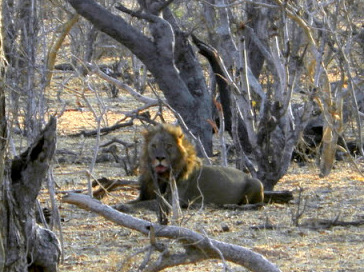 One told us there were lions feasting on a dead elephant not far from camp. She had seen them that morning. After a meal of traditional Botswana food, the cook and another staff member named Romeo, performed traditional African dancing. We could hear lions growling in the bush nearby. The guides cautioned to be sure we had a torch or headlamp if we got up to use the latrine at night, as lions will stay away from light, and to look for eyes glowing in the dark. If we saw eyes glowing, it was recommended you do your business next to the tent and quickly head back inside. I slept restlessly and heard the lions on and off for hours. I stayed in the tent until dawn. It was a chilly morning. 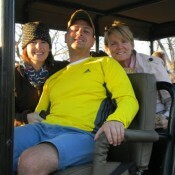 After coffee and a quick snack, we climbed in the safari trucks for a morning game drive. 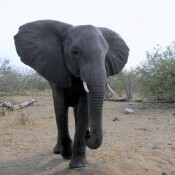 The guide drove us a few hundred yards over to the dead elephants. There was a dead baby and a female lioness had her head in the carcass, chowing down. Periodically, she would run over to the other carcass to scare off the vultures. 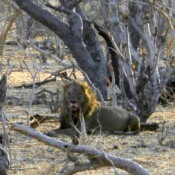 Close by was a male lion with a large dark mane and bloody chin. He had been feasting as well. We sat and watched quite a while. The male started heading off. Our guide called to him by mimicking the low rumbling lion sounds, a mischievous grin on his face. The lion turned and looked back. Then as we were heading off, he started following our truck. The guide would stop and call him again. On he would come. It was so cool to watch, but a little unsettling, as we were headed back through the campsite area where the cook and support staff were finishing up their work. 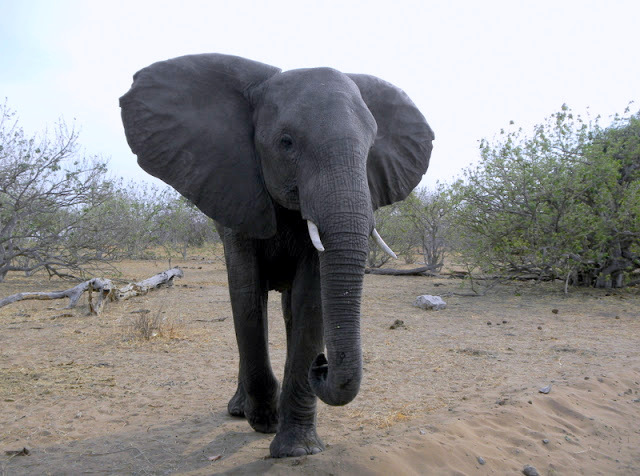 We spent another hour or so driving around, again seeing many elephants and giraffe. We came back for brunch, loaded up our belongings and left for a second game drive, before returning to Kasane. We stayed at the Old House which had wonderful rooms, a hot shower, and a nice restaurant and bar on site. The following morning, our Peace Corps buddy Octavious joined us for breakfast. 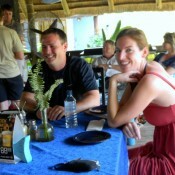 We wanted Betsy and Mike to at least get to meet another PCV. This day was to be a travel day. We were flying from Kasane to Johannesburg, then on to Maputo, Mozambique for the next leg of our trip. 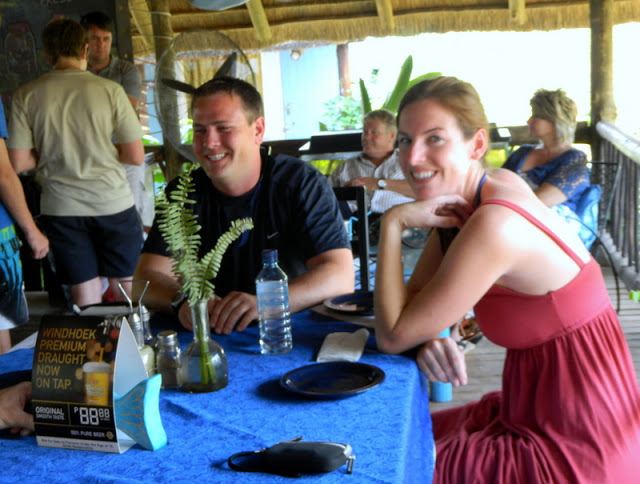 We were headed to the Indian Ocean beach town of Tofo. This entry was posted in Family, Peace Corps, Service - Year 2, Travel and tagged Botswana, Chobe, Mobley, Peace Corps, Travel. Bookmark the permalink. What a great description of all the happenings. The pictures are wonderful. Keep up the good work. I admire you for your accomplishments in the Peace Corp.